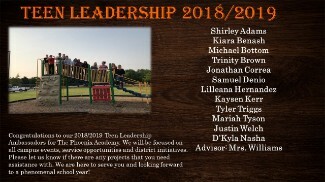 Congratulations to our 2018-19 Teen Leadership Ambassadors for The Phoenix Academy. We will be focused on all campus events, service opportunities, and district initiatives. Please let us know if there are any projects that you need assistance with. We are here to serve you and looking forward to a phenomenal school year.